The Hennemann is a fairly level stroll north from the Drei Kronen in Zapfendorf that will take 20-30 minutes on the path by the main road. The Hennemann is visible on the road at the Southern end of the village. 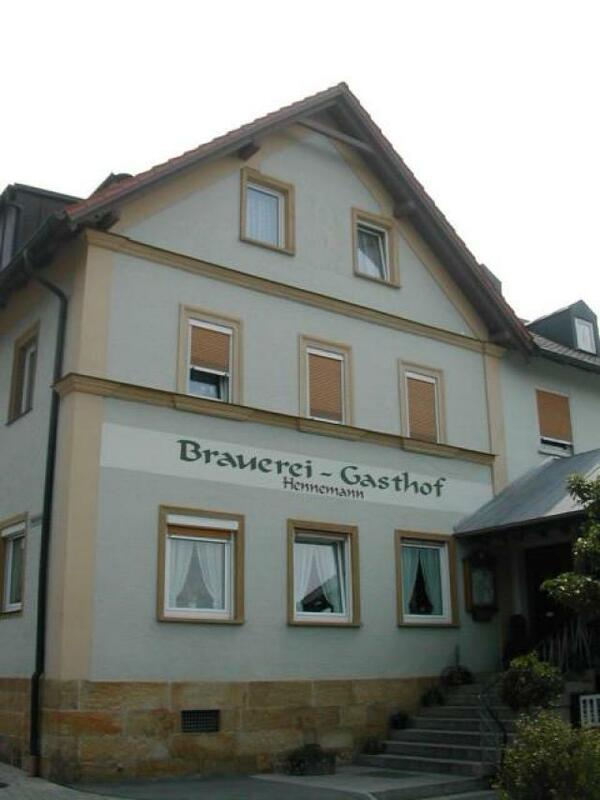 When you get there it is a pleasant Modern Franconian salon, with the standard Franconian menu, and a very nice Dunkel to wash it down with. Dark yellow rather than Dunkel. Big, aromatic malty taste with rich hops as a balance. Good Franconian lager in the rural style with more power than elegance. Very robust indeed. Spicy with a big aftertaste. A fine beer that deserves being introduced to a bigger audience. Malt ro hops seems to be about 50:50. Despite being well balanced, this beer kept its sharp corners. Well done, Mr. Hennemann! Henneman has a great hoppy bier that is well ballanced and has a wonderfull schaum. Well known for the bratwurst in that area as well. If not open, go next door and say hi to Herr Schober.. Another fine gasthause with plenty of warm essen. Tell him and the Stammtisch Robert Von Unterbrunn sent you. Which number is highest 36 or 5?